Crunchy French Toast Sandwiches | JPMA, Inc. 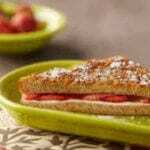 The crispy coating on these French bread sandwiches contrasts nicely with the strawberries, cream cheese and preserves in the filling. Spread 4 of the bread slices with cream cheese. Spread the remaining 4 bread slices with preserves. Top preserves with strawberries. Combine to make 4 sandwiches. In shallow bowl whisk together eggs, egg whites and vanilla. Place crushed wheat flakes cereal on piece of wax paper. Dip both sides of each sandwich in egg mixture. Coat with cereal, gently pressing crumbs into bread. In 12-inch nonstick skillet or on nonstick griddle, heat oil and butter over medium heat until butter melts. Add sandwiches. Cook over medium heat for 6 to 8 minutes or until golden, turning once. (If necessary, cook 2 sandwiches at a time.) Diagonally cut each sandwich in half. Sprinkle with powdered sugar.